When we introduced Classroom back in May, we asked teachers to give it a try. The response was exciting — more than 100,000 teachers from more than 45 countries signed up for a preview. Today, we’re starting to open Classroom to all Google Apps for Education users, helping teachers spend more time teaching and less time shuffling papers. One of the first schools to use Classroom was Fontbonne Hall Academy in New York. Sister Rosemarie DeLoro, who has been teaching for more than 60 years, had never used computers with her students before Classroom was introduced at her school. 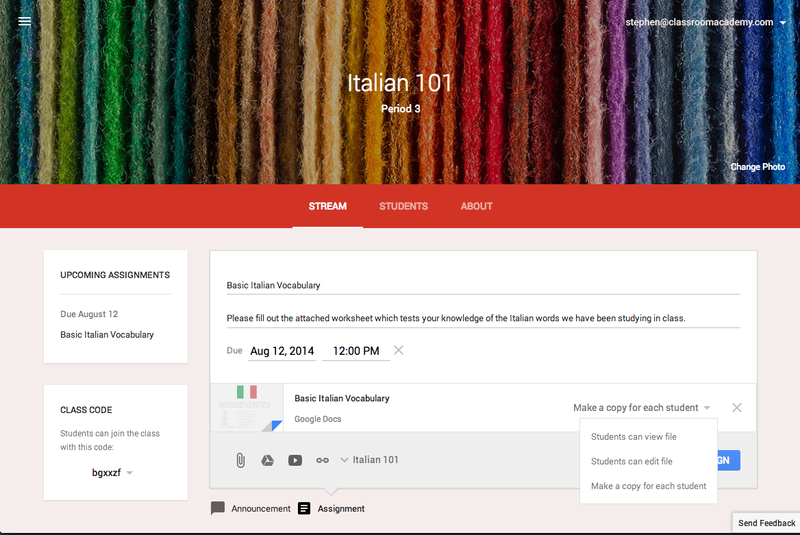 Classroom made it easy for her to assign digital worksheets to students in her Italian class and provide direct feedback to help them learn. In fact, after just a few weeks, Sister Rosemarie was showing the other teachers how to use it. “You can’t stay in teaching and keep going to the old ways,” she said. Teachers and students have been instrumental in helping us build Classroom. For example, we heard during the preview that teachers don’t want to wait until an assignment is turned in to collaborate with students. Now, with Classroom, teachers can view and comment on students’ work to help them along the way. We’ve also heard that teachers want a simple place to post information and materials about their classes, so we added an “About” page for each course, as well. When teachers create assignments, they can attach files from Google Drive — including Google Docs, Microsoft Word, Keynote, Google Slides, Excel, Google Sheets, and many others — then choose to automatically make a copy for each student. 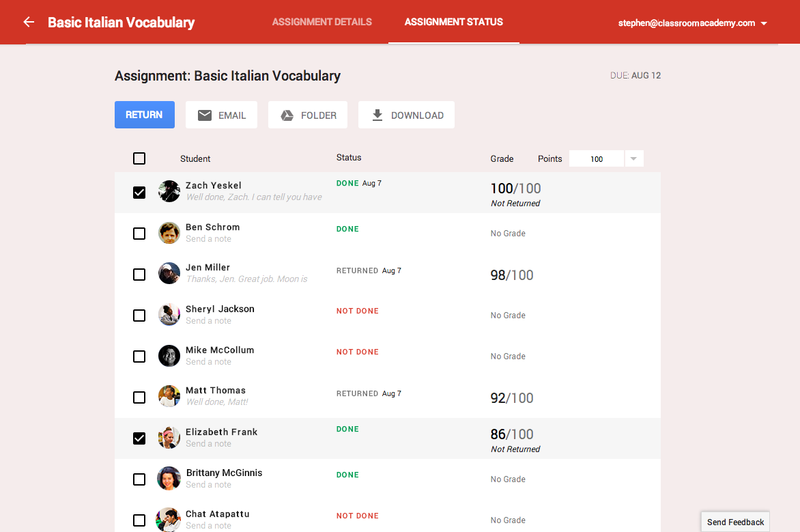 Teachers can review assignments from Classroom and provide feedback and grades to students all in one place. Classroom is available in 42 languages (including right-to-left ones, such as Hebrew, Arabic and Persian). It also works well on mobile devices and most popular screen readers. We’ll be rolling out to more users every day, so if you go to classroom.google.com with your Apps for Education account and don’t have access yet, please check back soon. Hopefully Classroom will help you spend a little less time at the photocopier and a little more time doing what you love—teaching. Cross-posted from the Google Enterprise blog.